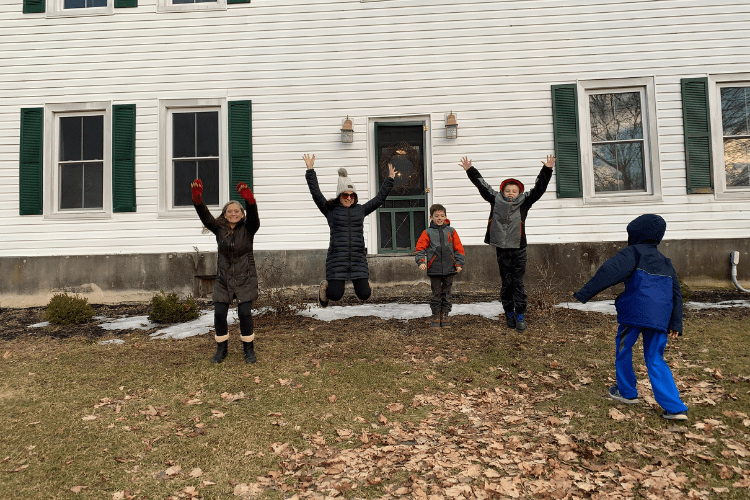 It was sunny and in the mid-sixties when we arrived at Blind Buck Valley Farmstead in Salem, NY. 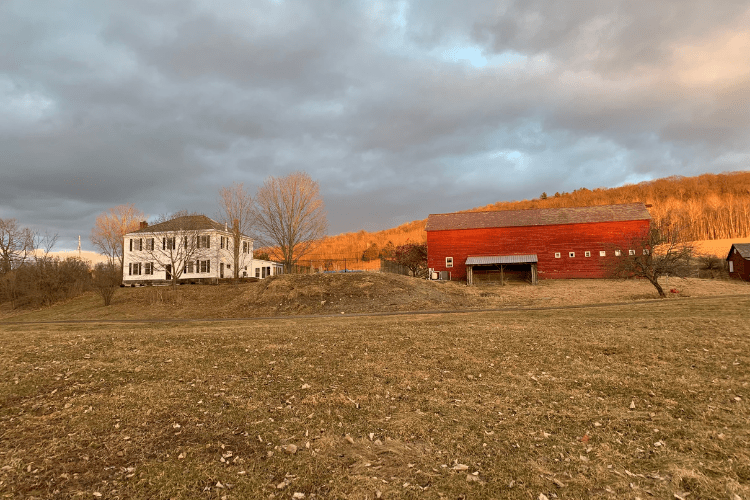 The sun bathed the farm in a golden mid-afternoon light and after a long winter, we needed the sun and the warmth. 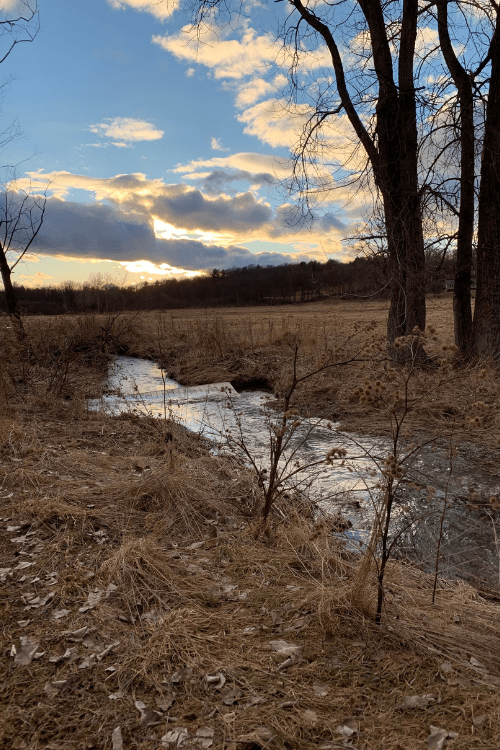 I felt the stress roll off my shoulders as my son beckoned me to follow him up one of the hills to see what was on the other side. The warm weather didn’t last but that feeling of relaxation and adventure stayed with us the whole weekend. We were greated on the farm by Lisa, who along with her husband Marty are caretakers for the farm. Lisa welcomed us into the house and gave us the full tour. Showing us the farm fresh eggs, along with the soft pantry in the kitchen. 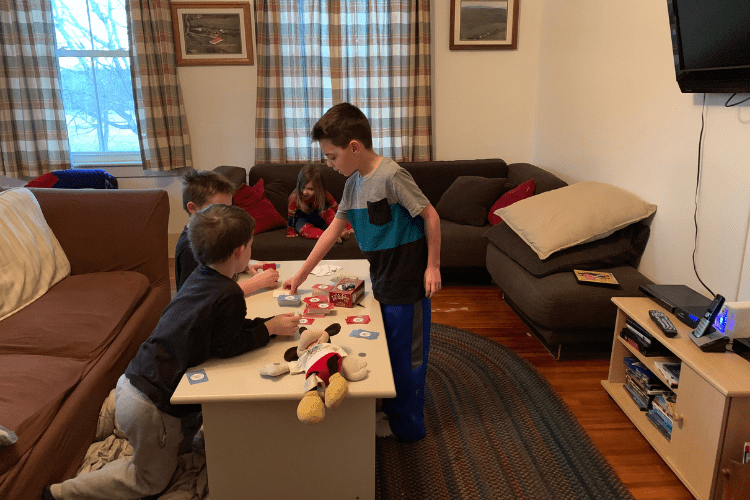 As we moved into the living space she was quick to point out all the of the amenities that the kids would enjoy like the cabinets full of games and toys and of course the ping pong table and foosball table. The kids wanted to jump right into the toys but there was still more to see. With one bedroom on the first floor with a bath, upstairs had 4 more bedrooms one that was perfect for kids featuring two sets of bunk beds! 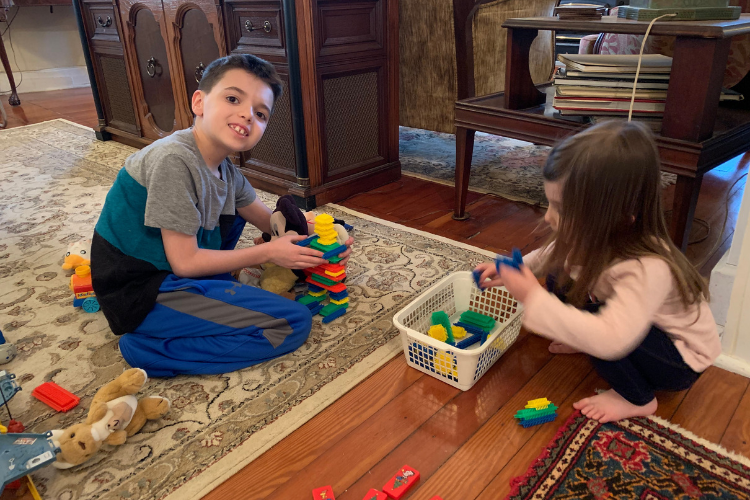 Jack quickly claimed that room as his, not knowing that in a few hours his friends would be arriving and the room would be a perfect spot for them. Another bedroom, has a library off of it, which is a great place for kids to play and hide out from their parents. Lisa left us with instructions to call her if we needed anything and promised to text us some recommended activities. We quickly went outside to explore the farm. Jack immediately made friends with a black cat and spent the remainder of the afternoon running up and down the hills. After 5 hours in the car, freedom had never felt so good. We headed inside and ordered some pizza from Pizza World, which was a quick ride down the hill. 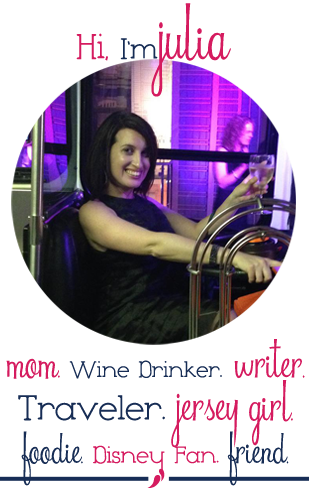 It arrived just before our friends, Jessica from Mommy University and her family, arrived. The kids were thrilled to see each other and the parents were thrilled to see food. I quickly put together a charcuterie board the product of a quick stop at the Hannaford grocery store about 30 minutes away. The sky outside was a perfect black and we all settled in for the night. 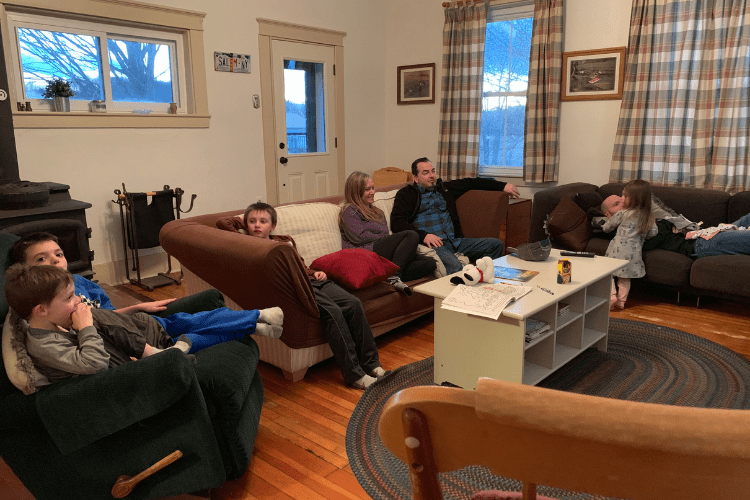 The kids played board games and foosball and explored their room while the adults enjoyed some wine in the sunroom which quickly became the adult’s hangout for the weekend. After the kids were tucked in we settled into the living room to watch movies. It was a perfect start to our weekend. I had thought farm air and a late night would have the kids sleeping in but they were all up bright and early and playing card games. Which was a nice change from the television and video games that usually mark a weekend at home. The boys playing card games early in the morning. We quickly cooked up the fresh eggs which everyone agreed tasted much better than store-bought eggs. 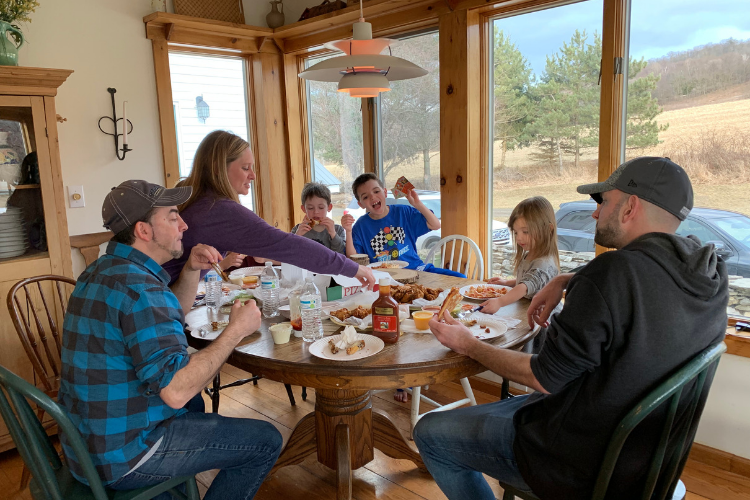 Jack insisted on showing the boys the hills and as Jess and I cooked breakfast and drank mimosas while watching the boys through the sunroom windows. 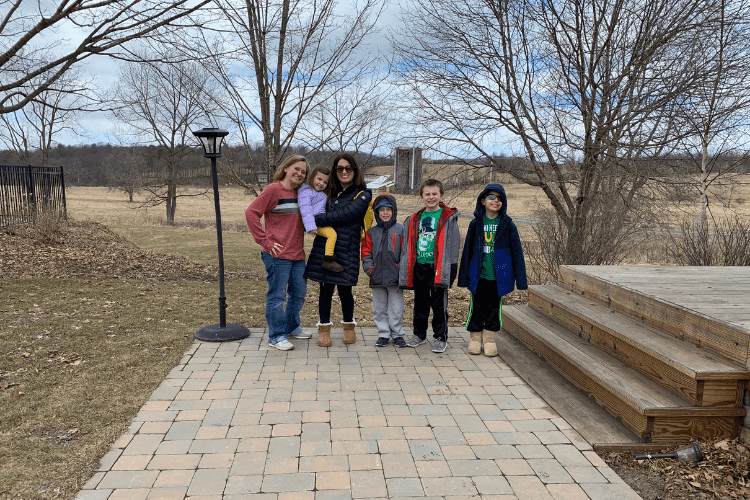 The kids were content to play at the house and bounce on the trampoline but the adults wanted to check out some of the places that Lisa had, as promised, suggested. Blind Buck Valley Farmstead is conveniently located near Saratoga Springs, NY; Lake George, NY; and Manchester, VT. The welcome book in the house provides you with plenty of great day trip ideas. Since we were all loving relaxing at the house, we decided to check out a few of the local places that Lisa recommended. 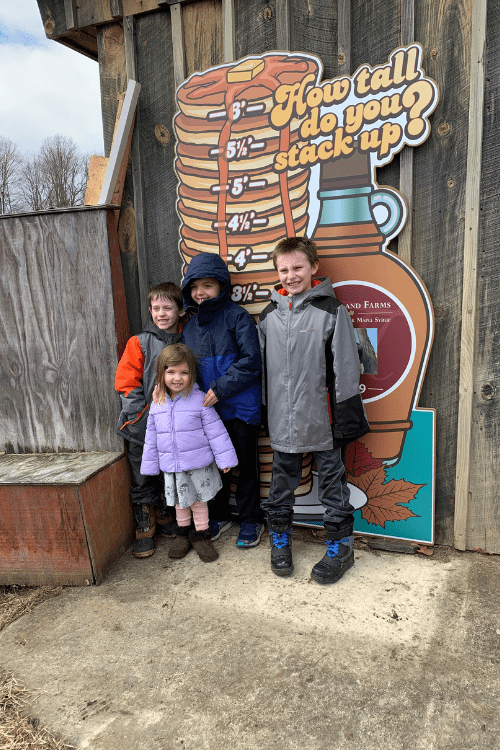 Our first stop was MapleLand Farms for a quick Maple Sugaring lesson. The staff and our guide couldn’t have been nicer or more informative. Next, we visited R.S. Taylor and Sons Brewery for a quick beer flight. The brewery is located on a beautiful property with a patio that I envision being packed in the summer months. Our flight was delicious, our favorite beer was the Coconut Cream Stout. We made a quick stop at Battenkill Creamery for ice cream before heading back to the farm. 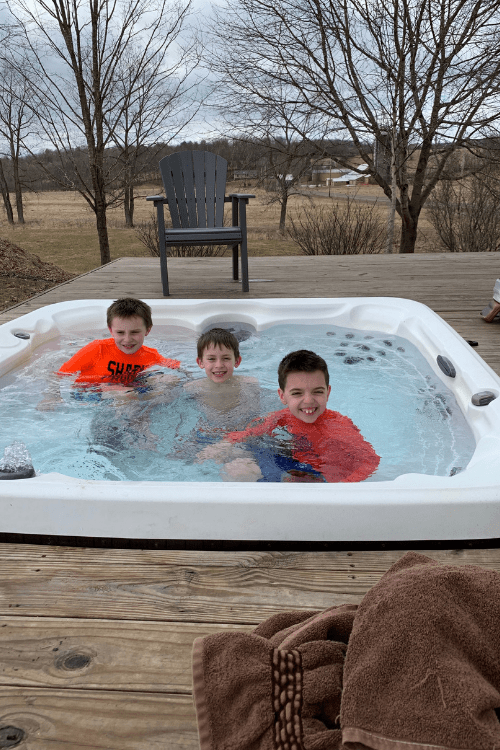 The kids were thrilled to be back at the farm and quickly took over the hot tub. The 37-degree temperature outside didn’t seem to affect their enjoyment of the hot tub at all. And after their dip, they quickly changed and headed for the trampoline. 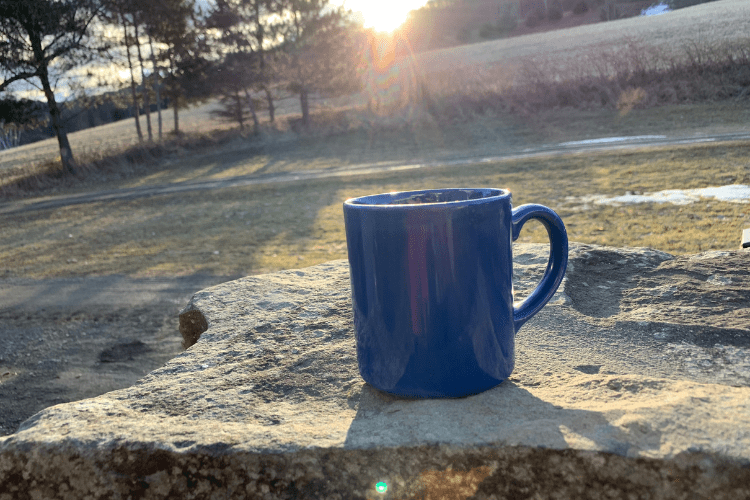 Refueled by a mid-afternoon coffee the adults went outside for a walk to watch the sunset. The sunset seemed to last forever. It was relaxing to watch the sun slowly slip down the horizon. 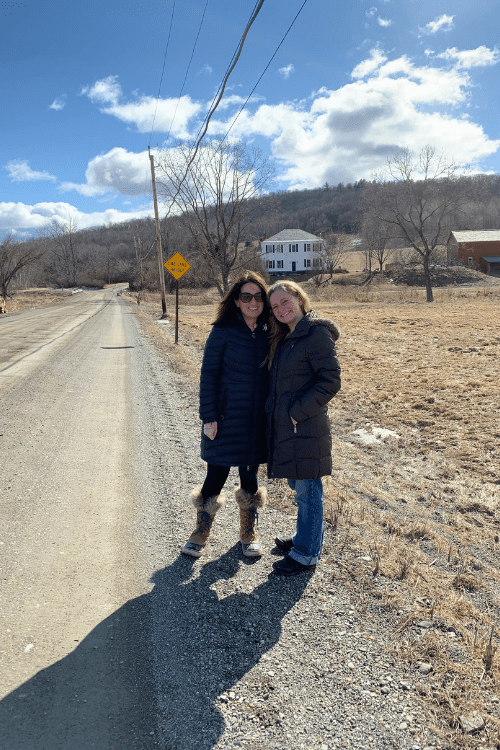 We felt so far away from everything as we ventured to guess which way was home and which way was Vermont. It was easy to get lost in conversation or to just watch the creek go by. 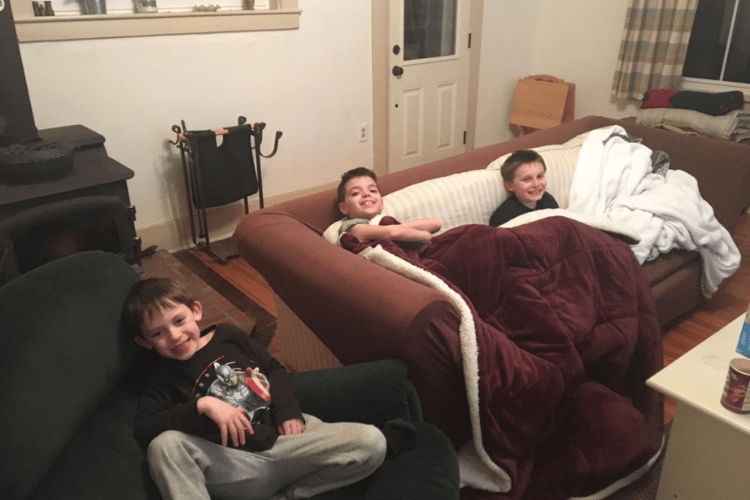 After dinner, the boys settled in for a night of 90’s Batman movies that were part of a large DVD collection in the living room. They were so excited to watch these classics but they quickly fell asleep in front of the TV, a long day on the farm finally got the best of them. The adults ended up in the sunroom as always where we laughed for hours playing card games and listening to the collection of CD’s we found. We found some old favorites from our high school days and took turns playing DJ. The next morning we were slow to get up and even slower to leave the farm. We felt as if we had been wrapped in a nice cozy bubble for the weekend, away from the hustle of life. We took things slower for a few days and weren’t really ready to go back. We took one last walk around the farm, taking in the views. 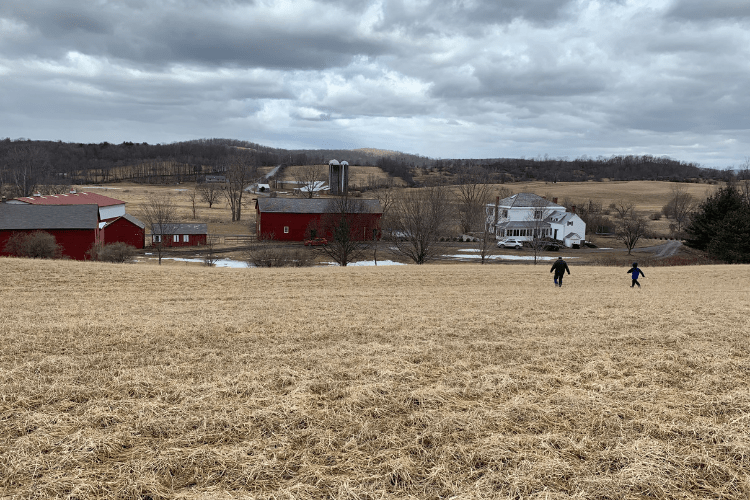 As we said goodbye to our friends and pulled out of the driveway the big white house growing smaller in the distance I finally understood what Blind Buck Valley Farmstead means to people. It’s a place to create memories, away from the craziness of life. It’s a place to unplug and unwind and connect with friends and family. It was an adventure one that required no tickets, planning, fast passes or characters. It was a slow-vacation in the best way possible. We were invited to spend the weekend at Blind Buck Valley Farmstead, all thoughts and opinions are my own. To learn move about Blind Buck Valley Farmstead visit them at their website or on Airbnb mention Wine In Mom and get $50 off a 2-night stay (excluding holidays). You can also find them on Facebook and Instagram. This review is part of our Year of Adventures series, where we are planning to have an adventure per month.